This is not about been extravagant with words. I will show you how easy to make more than 60% profit buying and selling both bitcoin and litecoin on Sleekarena trading platform. Cryptocurrency is really another stream of income that is very lucrative, but you need to know the tricks. One thing I like about cryptocurrency especially bitcoin, is the fact that it has the capacity to enrich people and its ability to eradicate poverty. Do I hear you say “I do not know what cryptocurrency or bitcoin is all about?” Then, why not go ahead and watch the videos below. Okay, the whole concept about making huge profit in this type of investment is “Buy Cheap, Sell High“. Always remember this! But how and where can I buy cheap bitcoin and litecoin? Then how do I sell at premium price when there are so many exchangers where people can trade crypto coins at global market price? These are the basic fundamental concerns trailing crypto merchants that are trading Over-the-Counter – trading with real people and not robots (i.e. peer-to-peer). It is also important to state that peer-to-peer trading is different from “margin trading” where investors catch on the price volatility of altcoins. This form of trade is risky in that you can lost all or substantial part of your digital assets over a short period of time if you do not understand trade analysis and market indices that influence price movement. With peer-to-peer trading, you are the one that sets the price you want to either sell or buy; you determine the payment method and also set the terms of trade. These provisions put you in control of the trade process. Then, the profit margin you set remains constant irrespective of global market price fluctuation of cryptocurrency. For instance, if you set 60% profit margin for the bitcoin you want to sell, this remains constant no matter the price of bitcoin whether it goes up or down. Your profit margin remains constant. That is, you always make 60% profit of the current price of bitcoin. So, if the price of bitcoin is 6300 USD (2,299,500 NGN), your selling price at 60% would be 10,080 USD (3,679,200 NGN). You have price markup tool to set your profit on Sleekarena trading platform. However, the first challenge in making profit is how to get people to trade with at the premium price you set. Just like any other buy and sell business, you determine the price you want to sell your product base on the added value you offer, even though there are other places that offer less prices. Trust and security are important factors to consider when buying or selling bitcoin and litecoin. You can leverage on this to justify premium price. For this reason, your target clients should be people around you or those you can reach and trade with one-on-one, like friends, relations, colleagues, school-mates, etc. These people can trust you, knowing that they would not be scammed. Now that you have set premium price and your target customer is defined, the next hurdle is to source for cheap bitcoin or litecoin on a regular basis. The first option is to locate a merchant like Cheapcrpto on Sleekarena and buy from him. He offers prices that are relatively competitive globally. The second option is to locate merchants on other cryptocurrency exchangers and then make the purchase yourself. 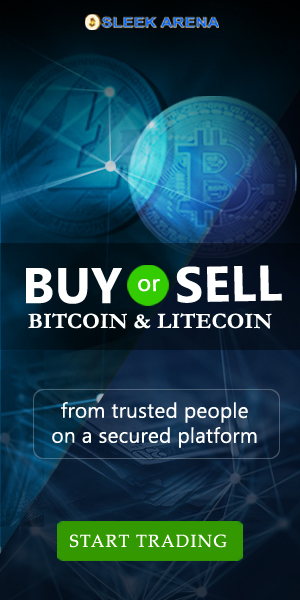 The last option is to engage us to help you buy either bitcoin or litecoin if you are not competent enough to buy it yourself. We offer this service free of charge only when you want to fund your wallet on Sleekarena. You may use the form below to contact us for this request. So, you can use any of the options above to buy both bitcoin and litecoin at cheap rate and then add your profit margin when you want to sell on Sleekarena. You may come for one-on-one training at our office if you are located in Lagos, Nigeria. Click here to book a session. We shall be glad to take you on cryptocurrency investment free of charge (FOC). It is important to replenish your wallet whenever you sell so as to be able to buy at the same prevailing global rate you traded (sell). Only then is your profit guaranteed. 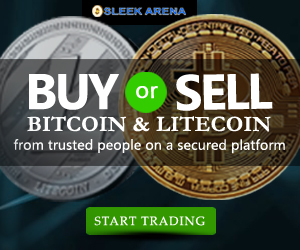 You can see that trading bitcoin and litecoin on Sleekarena is just like any buying and selling business. You buy and then sell at a determined profit. It is as simple as that. Make haste and become a cryptocurrency merchant today, making more money trading bitcoin and litecoin. It is indeed another stream of income for people who know how to use the internet.